KALININGRAD, June 21. /TASS/. Russia’s Defense Ministry plans to establish around 20 military units and bases in the Western Military District before the year ends, Defense Minister Army General Sergei Shoigu said at the ministry’s board meeting. "Around 20 military units and bases will be established in the Western Military District before the end of the year, around 40 garrison towns are currently being built," the minister said adding that modern weapons were being supplied. Shoigu also said that in winter, the troops deployed to the Western Military District had increased their combat capabilities by 2.5 times in comparison with the same period last year. According to the defense minister, the quality of junior military staff training has grown, more than 60% of training center graduates scored As and Bs in the exams. 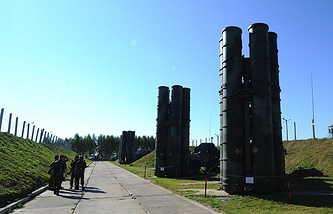 "Since the beginning of the year, more than 100 snap combat readiness checks have been held in the Western Military District, which confirmed that the troops were ready for military activities," the Russian defense minister stressed. Shoigu pointed out that the Baltic Fleet ships’ presence in the important areas of the Atlantic Ocean had been renewed after a long break.